Some miraculous performances and incredible matches were seen today at the French Open 2018. 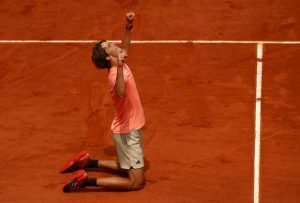 Dominic Thiem and Alexander Zverev from Men’s Tennis and Sloane Stephens and Madison Keys from Women’s Tennis made it to the next round of the French Open. Result: Dominic Thiem defeated Kei Nishikori at the French Open by 6-2, 6-0, 5-7, 6-4. 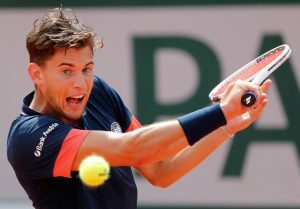 The Austrian Tennis star, Dominic Thiem, who defeated Mario Berrettini in the previous match, faced Kei Nishikori of Japan in the round of 16. Dominic Thiem took a good start as he defeated Nishikori in the first set by 6-2. Dominic was strucking some good aces against Kei which benefited him in scoring some points. In the second set, Kei struggled hard to beat him but Dominic sealed the win by 6-0. Although, Dominic made 9 double faults in the whole match but still he made it to the quarterfinals. As the third set started, Kei took the lead and after putting up a good fight against the Austrian, Kei won from 5-7. But still Dominic won the fourth set by 6-4 and proceeded to the next round of the French Open. Dominic Thiem will face Alexander Zverev in the quarterfinals of the French Open 2018. Result: Alexander Zverev defeated Karen Khachanov at the French Open 2018 by 4-6, 7-6(4), 2-6, 6-3, 6-3. Both the players Alexander and Khachanov played at their best against each other in the French Open 2018. Karen put up a good fight against the German in all the sets but eventually he failed to proceed in the next round. Karen won the first set and was looking in pretty good form. But the second set was worth-watching as it came to a tie. Alexander Zverev struggled hard and won the set by 7-6(4) and now both the players had won equal sets. The third set was again won by the Russian and he was now leading Zverev. But Alexander fought courageously against Khachanov and turned the tables in the upcoming sets as he defeated Karen in rhythm 6-3, 6-3. Alexander Zverev made it to the quarterfinals of the French Open 2018 where he will face Dominic Thiem of Austria. Result: Sloane Stephens defeated Anett Kontaveit by 6-2, 6-0. An exquisite performance was seen on the clay court today of the American Tennis player, Sloane Stephens, against Anett Kontaveit as she defeated her in the first two sets and won the match. Sloane made zero double mistakes in the whole match whereas, on the other hand, Anett made 4 double mistakes against her. Sloane, who defeated Camila Giorgi in the round of 32, was in pretty good form today as she defeated Kontaveit in just an hour and a half. It was Sloane’s 11th win in a row as she surpasses Anett to the next round of the French Open 2018. Quarterfinal match of Sloane of the French Open 2018 is still to be decided. Result: Madison Keys defeated Mihaela Buzarnescu by 6-1, 6-4. What a sensational and an absolute performance it was by the American player, Madison Keys, in the match against Mihaela of Romania. Both were favourites to win this round but Madison made it to the next round. Madison didn’t let the Romanian to stroke an a single ace against her in the whole match. Madison took a very good start in the first set as she won it by 6-1, letting Mihaela to make one point only. Mihaela put up a great fight in the second set but Madison wasn’t easy to beat as she won from 6-4. At last, Madison booked her place in the next round of Roland Garros. Madison Keys will now play against the Kazakh player, Yulia Putintseva, in the quarterfinals of the French Open 2018. Do join Allsportspk, so that you can see the French Open 2018 – Day 8.